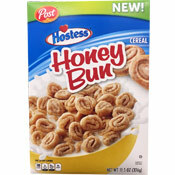 143 cereals start with the letter "H"
The complete name of this cereal is Hostess Honey Bun cereal. It's based on, and shaped like mini versions of, Hostess Honey Bun snack cakes. More Cereals That Start with "H"